Enamel Cast-Iron Casserole Oval Dishes. 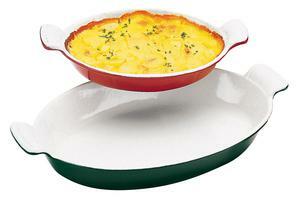 These enamel dishes are most commonly used for creating gratin, macaroni and cheese, creme brulee and egg dishes. They are ovenproof, dishwasher safe and compatible with all types of stovetops, including induction. All dishes are constructed from one uniform piece with easy to grip lipped handles. Note that all dimensions are interior and do not include handles or thickness of the material. Pricing is for 1 casserole dish.